Rotating Displays of Japan’s Largest Collection of Ukiyoe Woodblock Prints. The Japan Ukiyo-e Museum in Matsumoto is home to the Sakai collection of over one hundred thousand ukiyoe wood block prints -- the largest collection in the world. If you time your visit when the curator Sakai-san is present, allow him to give you a few pointers on the current exhibition to enhance your appreciation of the prints. The Sakai collection of woodblock print art dates back 5 generations. It began with Yoshiaki Sakai (d. 1842) who was one of the wealthiest merchants in Matsumoto during the 1790s. A magnamious patron of the arts, the Sakai family was visited by ukiyoe masters such as Hiroshige and Hokusai. Over the years, the collection has grown to more than one hundred thousand prints, both classic masterpieces and works by current artists. It is a "living" collection that continues to expand as the newest members of the Sakai family purchase and bring back rare prints from all over the world. The museum's aim is to "collect, examine and exhibit ukiyoe as being a major part of our international and cultural heritage." When visiting Matsumoto, home of the designated national treasure Matsumoto Castle and gateway to the Japanese Alps, include a stop at JUM (the Japan Ukiyoe Museum) and experience the world of Japanese woodblock prints. If the curator, Nobuo Sakai, is present and accessible, he can give an explanation in English about the current exhibit (due to their delicate nature, prints are rotated in and out of exhibition on a regular basis), to help deepen your appreciation of the artwork. Closed Mondays (or next day if holiday) and 28-Dec. thru 03-Jan.
Limited English explanation and the curator Sakai-san's English isn't fluent, but his enthusiasm makes up for it. 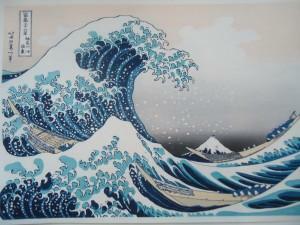 For further enjoyment of ukiyoe in Nagano Prefecture, there is the Hokusai Museum in Obuse. From Matsumoto Station(JR Shinonoi Line), 24 min by bus. From Matsumoto IC, Go west on Route 158 to Koshiba signal and turn right.